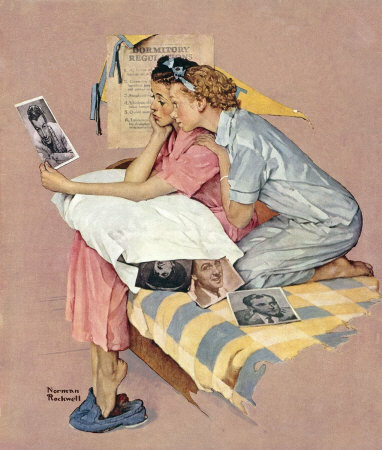 Two Girls Looking At Movie Stars Photo, a Norman Rockwell painting, was published on the cover of The Saturday Evening Post dated February 19, 1938. This image is another one of the favorites of Rockwell collectors the world over, an unmistakeable classic image of the universe that Rockwell captured on canvas. An alternate title is Dreamboats. This painting was Rockwell's 178th overall out of 322 total paintings that were published on the cover of the Post. From his first cover illustration, Boy With Baby Carriage in 1916 to his last, Portrait of John F. Kennedy, in 1963, Norman Rockwell's career with the Saturday Evening Post spanned 47 years. This was also the first cover for The Post in 1938. In 1938, there were six Norman Rockwell Saturday Evening Post covers published. The original oil on canvas painting, 32 x 26 inches or 81 x 66 cm, is part of a private collection. In this painting, Norman Rockwell show us some of the popular male movie stars of the day. Two college girls are looking dreamily at a photograph of Robert Taylor. Wilson was apparently the object of many American women's affections in 1938. Or at least the object of their imaginations. There are several other movie star photos laying across the dormitory room bed. I am sure these young ladies are relieved that the dormitory regulations only prohibit gentlemen in the rooms and not their photographs. I am not sure who the other actors in the other photographs are. We also cannot tell whether they have already been dreamed over, or if they are next in line. We can, however, see that the girls are ready for bed. They have changed into their pajamas. Two Girls Looking At Movie Stars Photo was only one of 322 Norman Rockwell Saturday Evening Post covers; Here is the list of Norman Rockwell Saturday Evening Post cover illustrations. We also can guess pretty well how they will dream. Maybe they will wake up with a longing sigh. Do You Have A Great Story, Opinion Or Contribution About Two Girls Looking At Movie Star's Photo?